“Shotgun!” my nephew shouted as he ran in front of his siblings, edging them out of the opportunity to sit in the front of the car. He was all of ten years old at the time, but could outrun his sisters. Riding shotgun has probably started and/or caused more fights among children than anything else. “I was here first!” he taunted back. “First come, first serve!” he added for good measure as he quickly jumped in the front seat and buckled up. He wasn’t budging. And so the childish argument starts, only to continue again on the next trip in the car. Dolce and Amore have the same disagreement over who gets dibs to sit in the front of the car. It’s a sure bet, Dolce will be in the car, haunches down in the front passenger seat before Amore has even thought about jumping up into the car. Safely ensconced deep into the bucket seat, Dolce has squatter’s rights in the front. Until there is a passenger. Or another canine that wants the same piece of vehicle territory. We are talking prime real estate here and it comes with a price. For the first four years of Dolce and Amore’s life, if I was riding along on the trip, I usually had a dog in my lap. Most likely it was Dolce. Tiamo would position herself in the middle of the back seat, peering through the two front seats, enjoying the air conditioning that blew towards her between the valley of the front bucket seats. In deference to Mama, Amore tucked herself way in the back of the SUV. The sitting dynamics changed drastically once there were only two dogs along for the ride. Boy did it change! Amore decided she had enough of sitting in the back-end of the car and it was time to move up front. Once she made her decision, she didn’t let anything stop her. It didn’t matter that I was already sitting in the chair, she didn’t care that Dolce was already in my lap. In Amore’s mind, it was time for a change. There was a new sheriff in town and there was going to be a shift in the sitting arrangements. The names on the place cards were to be rewritten. Now. It so happened on the day Amore came to the conclusion it was her turn to ride shotgun, I was coming along as well. We were only going to the market a few miles up the road for a few items for dinner. I told Malcolm to let me get in the car first, so I could buckle up before he let the dogs in, I then gave him the nod of “okay” once I was situated in the seat. He called to the girls and the race was on! Dolce shot ahead of Amore in her rabid eagerness to be on my lap. She plopped herself down across my lap, her back-end hanging over the middle console, her head already poking out of the open window. Only this time, Amore had designs on front. Before Malcolm had a chance to arrange himself in the front driver’s seat, Amore had jumped in his place. Though Malcolm patiently ordered Amore to move, Amore had other plans. Oh, she moved all right. She moved right across the console onto the edge of my seat, pushing Dolce down into the floorboard of the car. It wasn’t a good move. I now had two huge dogs in the front passenger seat with me somewhere underneath it all. Fur, paws and tails covered me. Dolce was spitting mad she had been usurped from her perch. Amore was gloating she had outmaneuvered Dolce. The childish argument began, a canine fight ensued. I was caught in the middle of it. Several paw scratches later, I ended up with Amore on my lap and Dolce sulking in the back. She was so upset she had lost her shotgun status, that she wasn’t on my lap, she barked the whole way up to the grocery store, sharing with us her great displeasure. She balefully eyed me from the back of the car. I had turned traitor on her, allowing Amore in her seat. Dolce was one mad mutt. 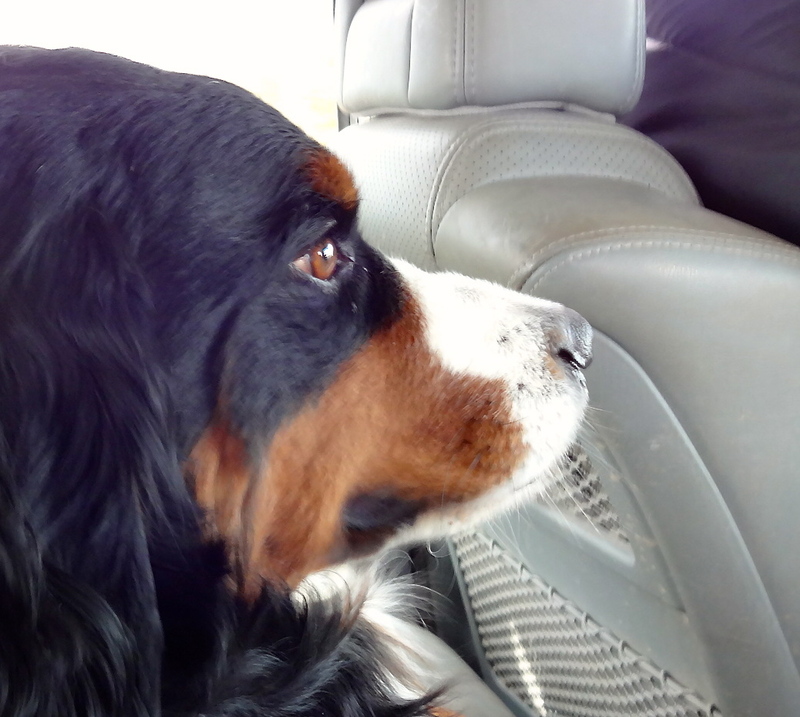 On the return trip home, I decided I would sit in the back seat to avoid all shotgun squabbles. Dolce was only slightly mollified. She liked the idea of being next to be in the back but she still was not happy with the new seating arrangements. Amore’s gloating had dimmed greatly. With me now in the back, she wasn’t so sure she liked her sibling sitting so close to me, she was sure that Dolce would get something she wouldn’t. Her distrust was evident. The two have grudgingly learned to share riding shotgun. Sometimes sitting side by side, scrunched together in the front seat. It’s a tight fit, with neither willing to give up their chair. Neither budging. Sometimes, one of them cries “uncle” and retreats to the back bench. Once in a while both will forfeit the passenger side, deciding to enjoy the ride in the back back. I now sit in the back with a bag of doggy treats to soothe the ruffled fur of the displaced mutt.